A visual feast. A fantastic, electrifying soundtrack, especially during the Live Aid concert. A great actor (Rami Malek) impersonating Freddie Mercury with great aplomb. And yet I found this movie disturbingly formulaic. It was a perfect write-up and I expected something darker. I also had a feeling the story was being told with the benefit of hindsight. Malek’s Mercury was so strangely confident that everything would work out, and some of the dialogue was just too on the nose to ring true. Still the worst was moralistic undertone, so at odds with different facts from Freddie’s life and his Queen’s career. I wish the director included glimpses of the famous 1977 launch party in New Orleans, featuring naked waiters, snake charmers, contortionists, drag queens, strippers dressed as nuns, and dwarves with platters of cocaine on their heads, a real Saturday Night in Sodom (and so it was called). Or a scene when Freddie gives a fan an autograph writing it on her naked bottom. Or at least that b-day cake of his. Do you think his mum would approve? But then the movie wouldn’t be marked as PG-13. A bowdlerized version of the ups and downs of Queen’s frontman. Still worth watching but not as fun as I hoped it would be. 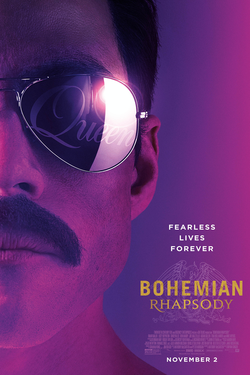 This entry was posted in biographical drama, miusical biopic, movie review and tagged biopic, bryan Singer, freddie mercury, great soundtrack, queen. Bookmark the permalink. I think they did dim it down to make it a lower in rating. If they included some more of the darker stuff it would’ve been an R for sure. The band members helped make this film so they probably gave the lighter version of the truth. And their mothers probably swooned when they saw that picture! Hear, hear. As far as I know some ex band members actually co-financed the production and helped with the script. I bet they wanted a movie as uncontroversial as possible. 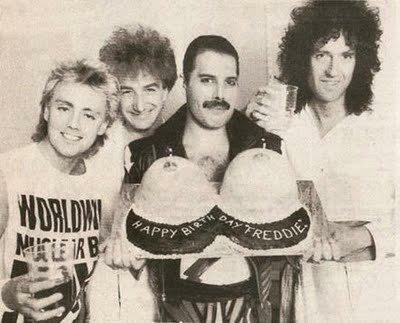 Freddie is turning in his grave with outrage. Rami Malek is really the only reason I want to watch this. Hopefully soon!